Workplaces partners with business owners, CEO's, and leadership teams to help grow their businesses, companies, and organizations. Tired of the rhetoric and outdated teaching styles in their line of work, the team at Workplaces came to Mediashaker looking for a website that would set them apart from other business coaches and consultants. The finished product delivers a strong message that speaks to the frustrations of their potential clients. It explains why current coaching practices don't work and how Workplaces is different. 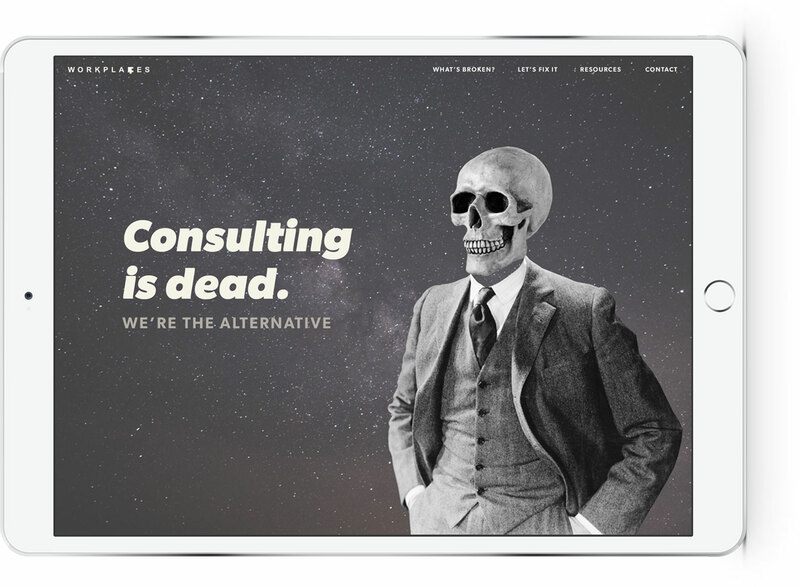 The combination of bold language and bizzare imagery makes this site unique within the consulting world. Workplaces gave us complete creative freedom to design a site that would shock the industry and "disrupt the market". When the site launched, that is exactly what happened. Workplaces not only needed their site to make a statement, they needed a site that would assist users in finding the right solution for their businesses's needs. To help with this, we developed a funnelling system that asks simple questions and directs users to specific services based on their answers. Potential clients can then inquire about these services. Workplaces facilitates the development of their clients through one-on-one teaching sessions and group workshops. Prior to the new website, Workplaces manually registered their clients for these sessions and workshops. Our site came complete with event listings, user registration, and online payments to help streamline their everyday workflow by eliminating these manual tasks.